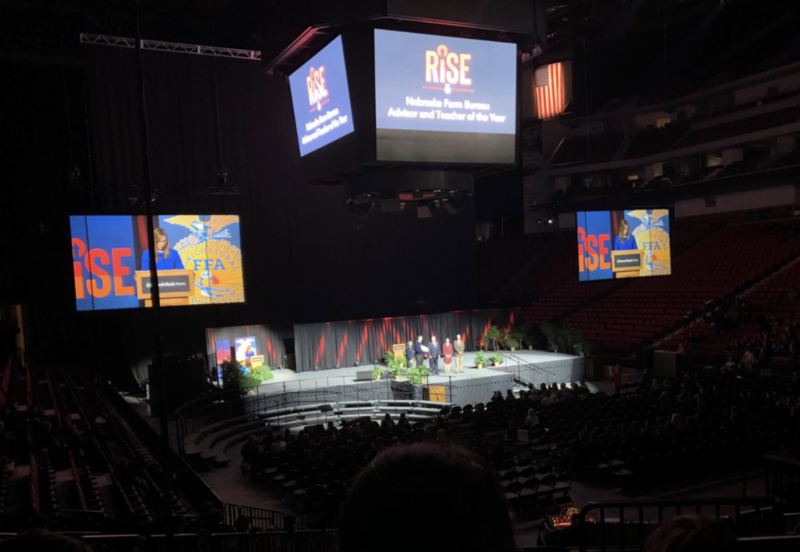 The 92nd Nebraska State FFA Convention was held April 3rd-5th in Lincoln, Nebraska. 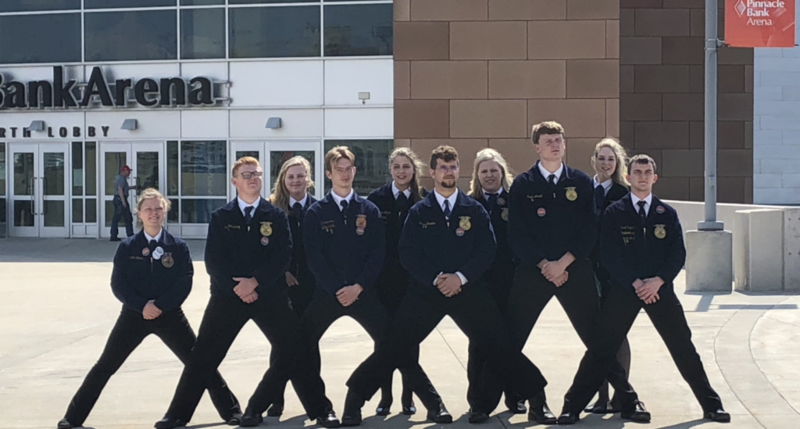 This year, the Fairbury FFA had 30 members attend the state convention. 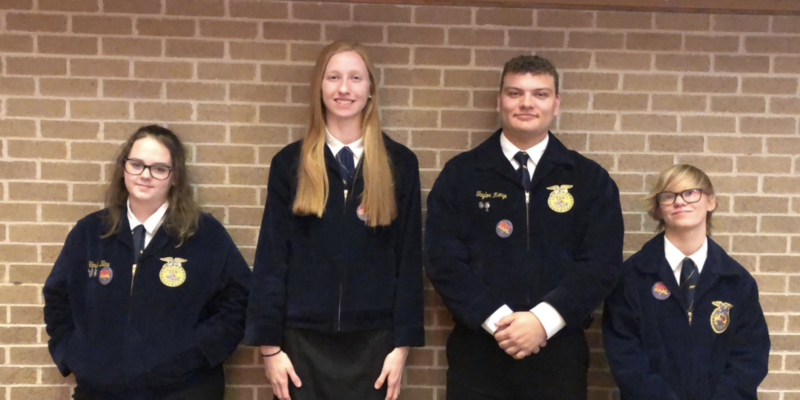 We had several members qualify for state CDEs and one student qualify for state LDE contests. Michaela Buchli placed in the top 10 for her Senior Public Speech over Lab Produced Protein and received a silver medal. 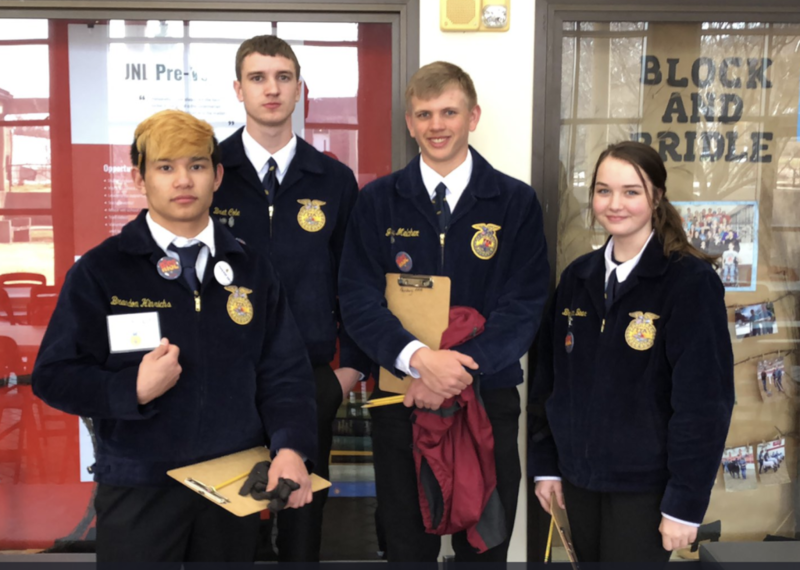 The Ag Sales team was made up of all sophomores including Devin Wanamaker, Dalton Petersen, John Kerwood, and Kennedy DeBoer. Devin Wanamaker earned a blue ribbon. The next contest was Agriscience which is a freshman or first year contest. It was made up of Zach Furrow, Chase Dragoo, Brigham Sheetz, and Ashton Blobaum. None of them earned a ribbon, but it was a great learning experience. The Agricultural Biotechnology team consisted of Sara Huss, Sarah Engleman, Jillian Caroon and Autumn Branson. Huss earned a blue while Engleman and Caroon both earned reds. 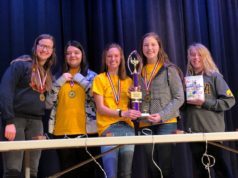 They placed 8th overall as a team. 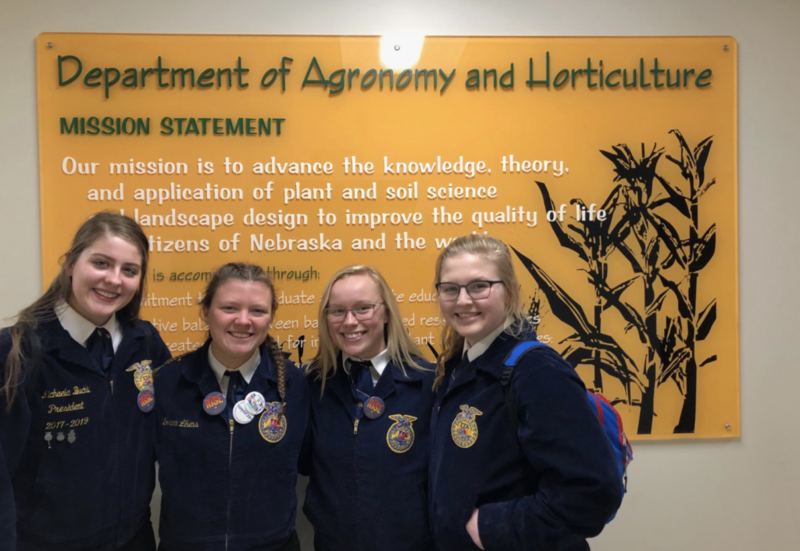 The Agronomy team was made up of senior Autumn Branson, juniors Taylor Runge and Sara Huss, and sophomore Harlie Blas. Sara received a blue ribbon. Harlie received a red and Autumn received a white. The Natural Resources team was made up of Michaela Buchli, Trevin Arnold, Delaney Miller and John Kerwood. Michaela earned a blue ribbon, Kerwood earned a blue and Arnold earned a white. The Meats & Technology team was made up of Joe Melcher, Brooklen Bear, Brandon Hinrichs and Bret Cole. None earned any ribbons. 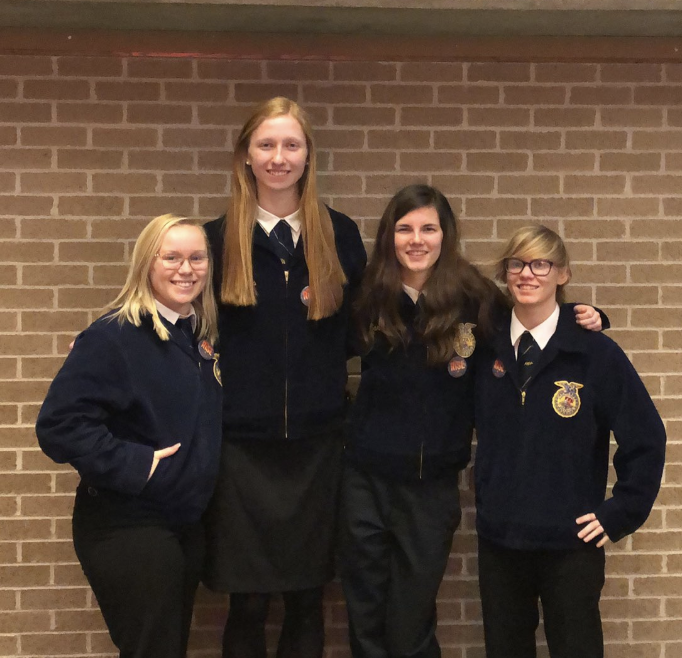 The Farm Management team consisted of Michaela Buchli, Jillian Caroon, Toriann Likens, and Kaylee Sipek. Tori received a purple ribbon while Jillian and Michaela each received a blue ribbon. The Farm Management team placed 18th overall out of over 70 teams. The final contest was Nursery and Landscape. This team consisted of Jared Engleman, Riley Wood, Harlie Blas, and Christina Hickey. Engelman and Wood both earned red ribbons. 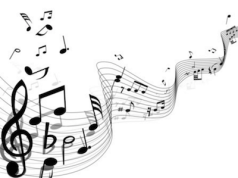 Taylor Runge was the sole representative for Fairbury FFA in the State FFA Chorus. The Fairbury FFA Chapter was also represented by 10 FFA members who received their State FFA Degree. The FFA State Degree is the highest degree the Nebraska FFA Association may bestow upon a member. 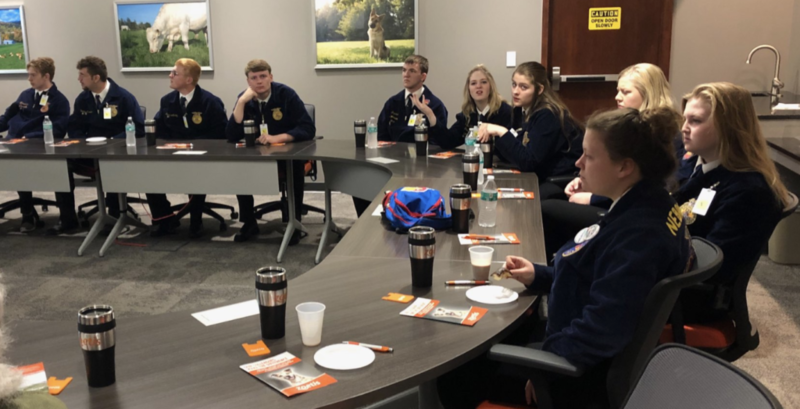 FFA members must submit two years (24 months) of consecutive SAE record books, complete the FFA State Degree application and meet all minimum qualifications as well as earn a passing score of at least 70% on a State Degree assessment. Students have to also meet the criteria for financial gain in three ways: productively invested at least $1,000 and must show SAE earnings of at least $3,000, productively invested at least $3,000 and must show SAE earnings of at least $1,000, or must have productively invested at least $1,200 and must show SAE earnings of at least $1,200. 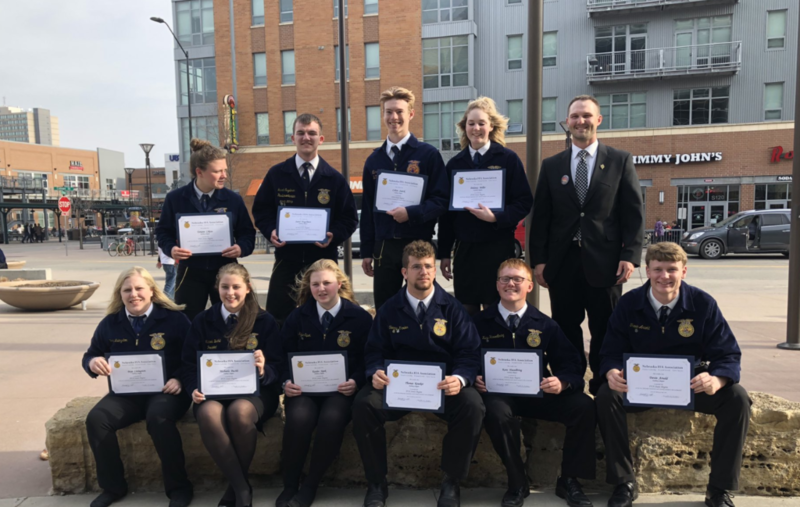 The Fairbury FFA Members who received this award were Bryn Livingston, Michaela Buchli, Toriann Likens, Kaylee Sipek, Kane Hasselbring, Tommy Kroeker, Jared Engelman, Delaney Miller, Colton Starck, Trevin Arnold.